Author: David, is there anything you wish you could do over again? 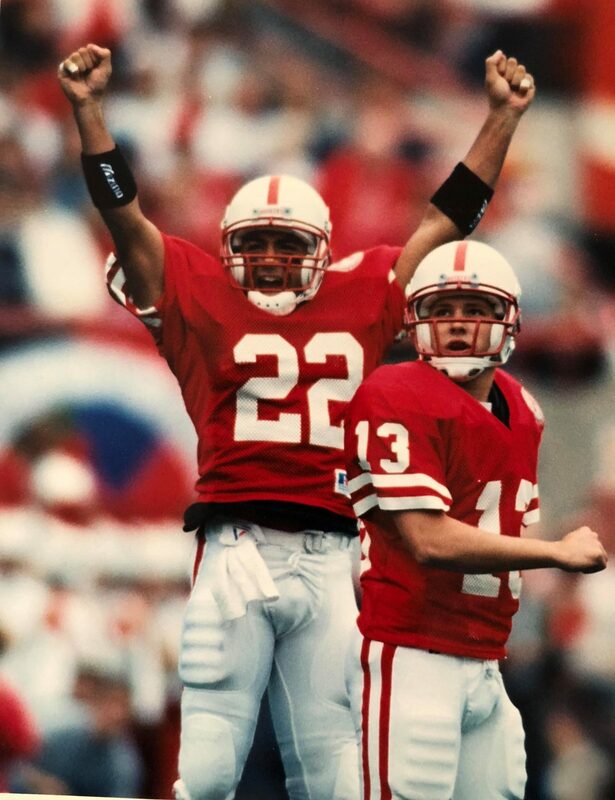 David Seizys: It would have to be that field goal (to end the ’94 Orange Bowl). Q: Let me ask you now: you said two years later you realized it was a good hold? DS: Yes. It was a good hold. But it was one of those things where your kicker is getting ready to kick… and I wish I would have said something to help him to relax. Q: Obviously, you were able to get in the huddle because Florida State had called a timeout, right? Can you remember the huddle? DS: I’m glad you brought that up. I do remember that. 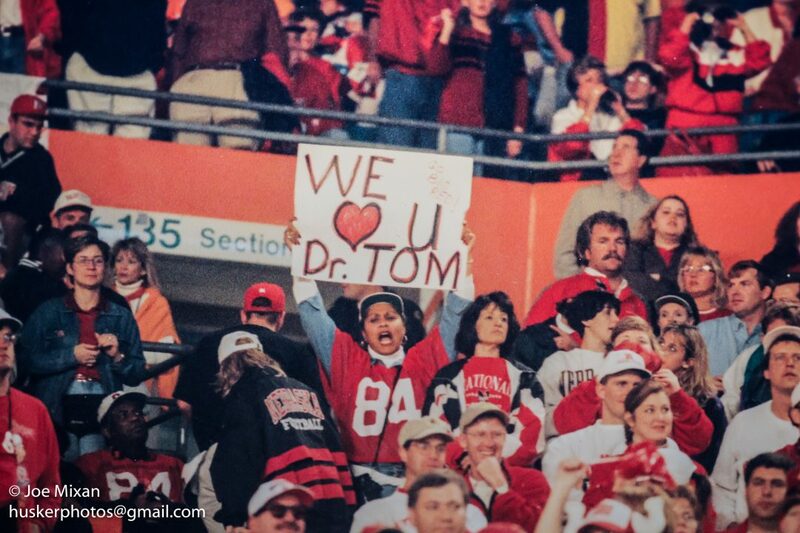 And that was in response to, “Did we get the timeout?” Tom Osborne went out there, “Was the timeout called?” Then he was arguing the spot. They didn’t have replay then, so they spotted it where they spotted it. Q: Do you think Byron is ever haunted by that final attempt? DS: I’m sure it did, or probably does. I hate to say it that way, but it would have to. I mean, I was the holder and it took me two years to watch it. I remember the next bowl game and I was with my folks in Wyoming at the time, watching with my folks, and the winning touchdown going in was such a release of emotion. I was just weeping at the fact that Nebraska had won. I remember saying -I’m crying and looking at my Dad- and saying, ‘The monkey’s off our back! We won, we won!’ It was nighttime in Wyoming and I started lighting off fireworks. It was awesome. And the national championship celebration after that, I felt like I was a huge part of that, being a former player. David Seizys: jubilation…Byron Bennett: business as usual. Q: Was Ron Brown your position coach? DS: He was an incredible spiritual mentor to me. My mom and my dad are neat Christian people. And if you were to ask me who my hero was, without hesitation I would say my dad, and a close second would definitely be Coach Brown. Every day, just by his mere presence, he demanded excellence. 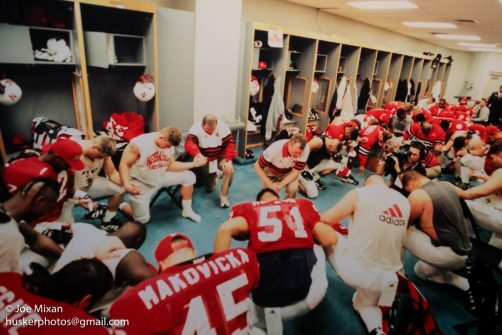 And it wasn’t that stereotypical, ‘hard-nosed coach excellence,’ it was excellence because you have God-given ability and you have to give it all up to Him. It was that kind of presence. Q: Any one person under the radar who meant something special to you? Someone behind the scenes for you or your teammates? DS: Oh, man. There’s so many. If it was a friendship thing it was quarterback Joel Cornwell. We were pretty good friends. He was my roommate on road trips. But as far as the whole scope of things, Tommie Frazier comes to my mind because of the fact that he’s one of those guys when he first walked on campus, that expectation of him. And he started his freshman year. There‘s something special about him. Q: Tell us what was it like to finish a punishing practice and then you have to go straight to the weight room for lifting? DS: Oh, man, it was brutal. (laughs) After a while you just get into that mentality, ‘This is one way of making myself better.’ For me, I knew I was a walk-on and couldn’t cut corners. For me it was kind of a release, ’cause I knew the weights weren’t going to beat on me. I just kind of bought into the bigger, faster, stronger thing, but there were days you walked off the field after a 100 degree practice and the weight room is the last place you wanna be. But you knew it was for a greater purpose. Q: What went through your mind on performance testing day, when you ran the ten and forty yard dash, the vertical jump, the pro agility run? DS: It was one of those dreams where I always did the best I could. I never wanted to look back and wonder if I could have pushed a little harder. I was just one of those kids who grew up giving 100%, and the coaches would say, “This is a 50% practice.” I always wanted to go hard, and it’s the only speed that I knew. Q: What do you do now? DS: I’m a 6th grade teacher. I coach high school football and track. Goodrich. I teach math. Q: Tell me, what kind of attitude was instilled by Coach Brown? Not being the prototypical prima donna receivers, how did he instill the attitude? You guys were some nasty little cusses out there, weren’t you? Q: And your response would be? DS: ‘I don’t want a zero on the grade card! Sorry!’ (laughs) So we’re cutting these guys down at the end of the game and they’re running for their life. The ones and twos had been cutting them down, too. We’re just trying to get our little piece of the pie. Some of these guys, toward the end of the game, they’re just cutting and running from us. They don’t want anything to do with us fresh guys just coming in. We’re diving at air, because they’re running a 4.4 the other way. We’d get turf burns all the time. Sometimes it’s just a beautiful piece of work and he‘s ready to hit you, and you clobber him and his feet are straight up in the air. It was great. Those were great times. That was kind of funny, because they opened up spring practice one time during the Callahan era, and me and Riley Washington and Abdul Muhammad came back and we’re just yucking it up on the sidelines because those receivers out there, they had no clue on how to block. It was kind of funny, because we were heckling them a little bit. A lot of those guys were just having a hard time getting off of jams and were trying to block. It was something that just wasn’t instilled during the previous four years, but they were working hard. So it’s coming around. Q: Any peculiar practice stories from the 90’s? DS: When we were getting ready for the ‘94 Orange Bowl they were piping in the tomahawk chop song like Florida State would do, and I’m standing next to Coach Osborne and I say, ‘I bet you have this on CD playing in your house?’ And he said, “Man, I hate this song!” It was such dry humor. Q: Any locker room guys that really stand out from those days as far as leadership? DS: Trev (Alberts) was, and Kevin Raemakers was, and (John) Parrella. They were awesome guys there that literally were huge, figuratively were huge in their leadership. And you know, I’ve heard horror stories of hazing in the Callahan era and even the Solich era, but in our time it was flat out, ‘we were a family, that didn’t happen.’ But as far as leaders, those were three huge leaders right there. Q: Any summation of things that we haven’t touched on? Inner workings? Special significance? DS: I don’t know if anybody else would go this direction, but I truly think God had his hand in that era. You look at Coach Osborne. Look at him. He’s not one of those huge rah-rah guys, but spiritually he had it together, and there was something about him and his spiritual life that attracted others and held others intact. And in the day and age of running off to the highest paying positions, we had continuity and we had bible study together in the mornings. They were doing the work of God, and I know that had something to do with it. There’s a whole lot of people out there that don’t want to hear that or disclaim that but I don’t know how you can, because Coach Osborne had his priorities that were the high standard of God first, family second, and for us it was school third and football 4th. He lived it. It wasn’t just lip service. The thing that was a huge thing there was not only did coaches and players have loyalty to him, but he had loyalty to them. That doesn’t happen very often anymore. To this day -it still blows me away- he knew exactly who I was the first year of practice. He knew who my parents were, and here is this god-like figure and he’s thanking me for being on the team. And to this day he’s still, “Hey David, how are you and your family?” To this day he’ll stand there and have a conversation with you and actually talk. It’s the untold things, the absolutely spiritual nature of what was going on there, God’s hand was on that team from the get go. The loyalty both ways, being reciprocated both ways with the coaches and the players, it was just absolutely incredible. 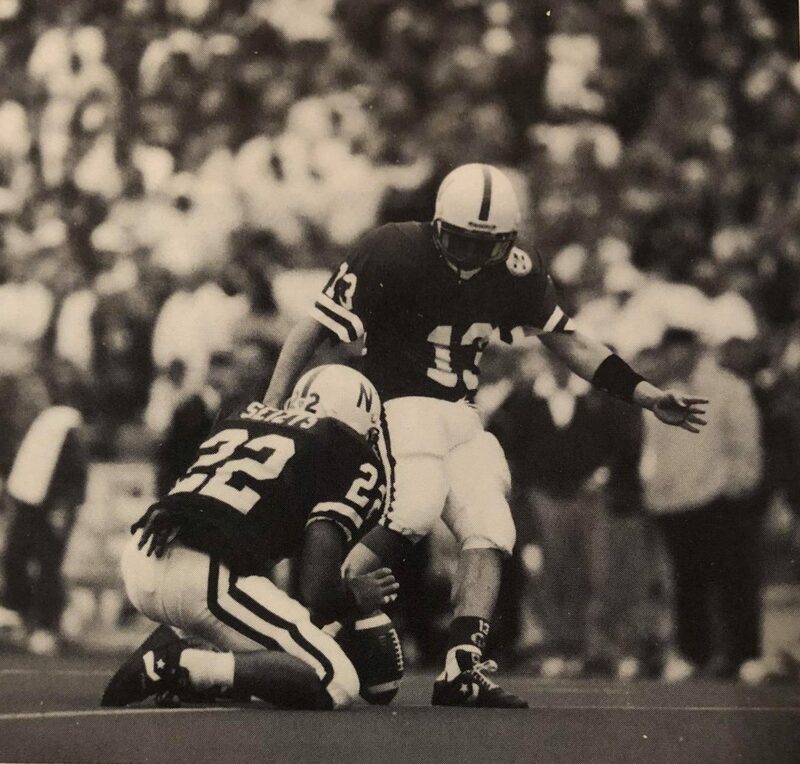 A few things danced around my head as I hung up the phone on this conversation, and number one was the fact that this rough and tumble game of football leaves an indelible mark on the young men playing it. It took the span of an entire two years for him to distance himself from the pain of being a part of that missed, last second field goal attempt for an elusive national championship. Two years! I can only imagine what it meant for him to hold the tip of the pigskin to his index finger before Byron gave it a swift boot, dreams and last chances and the end of a boyhood dream summarily becoming crushed in the aftermath. The second and most profound statement I latched onto was when he spoke of the Almighty’s hand in things. I don’t want to get too spiritual here, because I’m seeking tangible, physical, codified reasons for why those teams were so great, but I have to conclude that a sense of providence – something, or Someone– had a hand in all of that success. Perhaps a Diety and its outgrowths will show themselves in this journey, but for now I want to keep on searching as we track down and converse with the varied individuals who played their respective part. One last thing stayed with me, and it was David’s mentioning the rocky start-up of the player-represented group named The Unity Council. We’ll hear more about it as we go on, but the inherent seriousness and sense of duty it created must have crossed a crucial bridge for the players, with the coaching staff handing off minor policing of their peers to do as they felt proper. I recall a point made in Jim Collins’ book Good to Great, where he speaks of having ‘the right people on the bus.’ The Unity Council separated the right people from the wrong and a line was crossed into greater accountability, focus, and respect for the goal of the institution known as Nebraska Football. 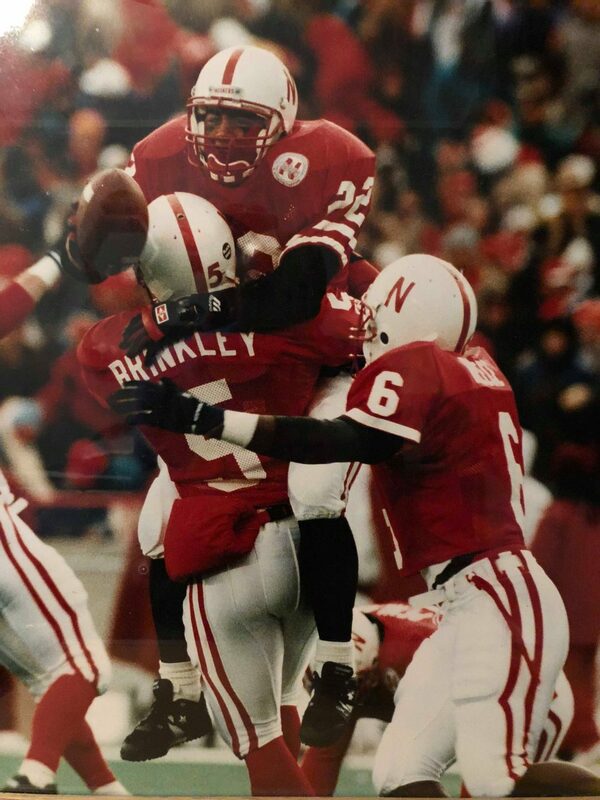 With a mention of the outstanding leadership by previous years’ defensive linemen John Parrella (’92), Kevin Raemakers (’93) and Trev Alberts (’93), the genesis of the Unity Council was definitely a bold and bright move by Coach Osborne and staff.